Every Friday, during the summer, in the Baluard de Sant Pere, situated in Dalt Vila, the Colla de Vila and the Colla de Sa Bodega offer demonstrations of traditional dances from Ibiza. The demonstrations cost 1 euro and begin approximately at 9:30 p.m. The shows are a perfect opportunity, for residents and tourists visiting the city, to get to know the typical Ibizan dances ("la curta", "la llarga", "la filera"...) passed down through the centuries. 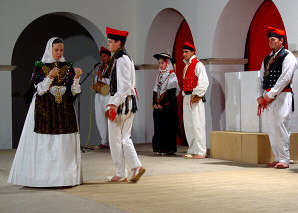 The dances are accompanied by short explanations about the origin and meaning of each dance, the instruments (drum, flute, castanets...), ladies dress and menswear. The night is completed with the share out of traditional Ibizan liquor distilled from local herbs and doughnuts.